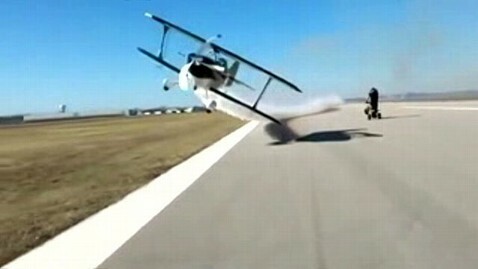 The pilot performing a breathtaking feat in a video posted online in which an aerobatic plane travelling at 200 miles an hour comes within feet of a man on a Texas runway was performing the stunt on an expired waiver, ABC News has learned. Newburg's waiver to perform aerobatics expired in November, sources told ABC News. And even if it hadn't, pilots are required to ensure the safety of people on the ground. "Several points along the way this guy could have make mistakes that would have killed himself, and the two people that are filming the action here," ABC News aviation consultant Steve Ganyard said. Newburg often performs with motorcycle showmen known as the Dallas Stunt Riderz, who choreograph maneuvers beneath his bright green plane. But the FAA is apparently not amused by his adrenalin burst of showmanship, telling ABC News it is investigating the incident. Efforts by ABC News to reach Newburg have been unsuccessful. Newburg's company was involved in a helicopter crash in 2008. The National Transportation Safety Board report on that crash says the pilot, who was not named, was not licensed to fly a helicopter, and that he took off with, instead of against the wind, causing a hard landing.